So, after fighting with my wife about leaving early then getting stuck in traffic (proving my point), then having a hard time finding parking because we left late (again, proving my point) we got to our seats just after 8 p.m. Yes, I already knew comedian Jim Breuer likes to talk, and did he. A cool opening act by the way, much better than an opening band – but Metallica pulled a Madonna and finally took the stage at 9:15 p.m. nearly 30 minutes later than their arrival in Spokane. Thus, proving my wife’s point. We had plenty of time. Seriously, what the heck are they doing backstage? Get on with the show! In the best concert I have seen all year Metallica fine-tuned the sound and delivered a masterpiece along with a 19-song epic setlist, playing for nearly two and a half hours. Did someone in their camp read the Spokane review and make some adjustments or did a bit larger venue hold the acoustics better? Doesn’t matter. On this night Metallica delivered their goods to a sold-out crowd at the Moda Center in Portland, OR their first area stop in 10 years as their WorldWired Tour moves into year two in support of their 10th studio album Hardwired…to Self-Destruct released in 2016. 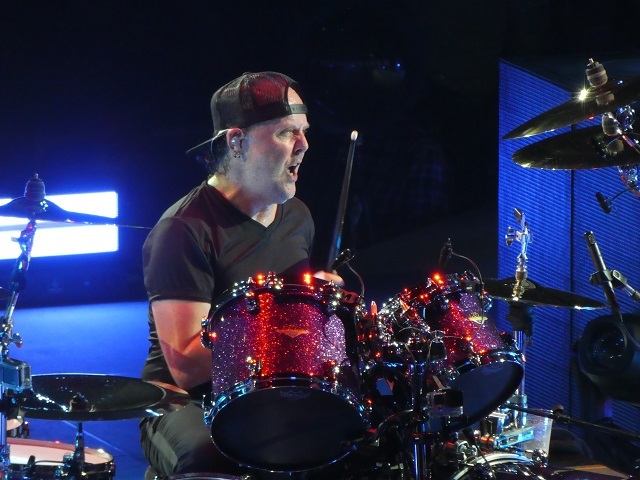 The bass that often overpowered everyone else on Sunday took its rightful place by driving melodies forward in the background as Lars Ulrich’s drums found better life while James Hetfield and Kirk Hammett’s guitars took center stage, when required, striking power chords and blistering solos all night. Metallica keeps a core set of songs to anchor the setlist and switches out a handful to keep it fresh (no doubt for them too) and the fans guessing – at least for those who may see them more than once or follow the tour to see what they play. 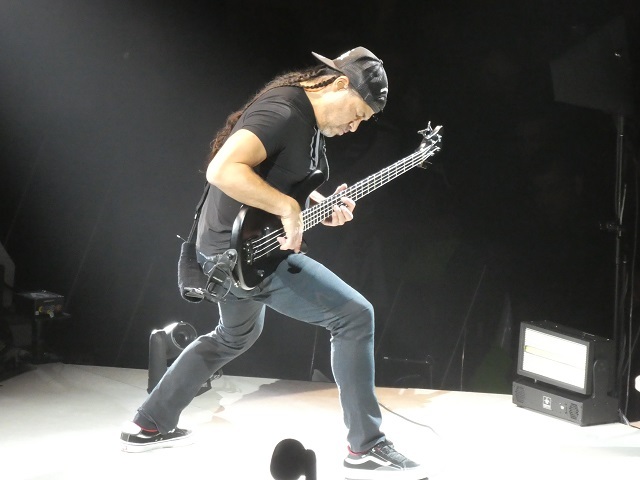 Like Sunday, Metallica opened with two off their latest, their old-school classic “Seek and Destroy” and then ripped into one of the most overlooked songs in their catalogue “Holier Than Thou” an absolute gem off their self-titled smash release from 1991 commonly known as the Black Album . Hetfield teased the crowd with maybe playing some older songs. Indeed, it was the old songs that built the band’s following nearly 40 years ago and despite some who fell away over the years and not appreciating the band moving forward as all careers demand, Metallica obliged nailing versions of “Creeping Death,” “For Whom the Bell Tolls” and “Fade to Black” – all three off Ride The Lightning from 1984. After a cover song from the defunct Portland punk band Poison Idea sang by bassist Robert Truillo with Hammett at his side, Metallica brought more goodies from the past with “No Remorse” off their debut Kill ‘Em All and the unappreciated “Fuel” off 1996’s Reload . Rarely do I get chills at a band’s performance, but the crescendo to “One” released some shivers and then on to “Master of Puppets” another beloved jewel by fans and radio – a song now more than 30 years old that fully stands the test of time. Metallica concluded the evening with the fifth and final off the new album “Spit Out the Bone” then the metal balled “Nothing Else Matters” and finally “Enter Sandman” those last two off their Black Album. 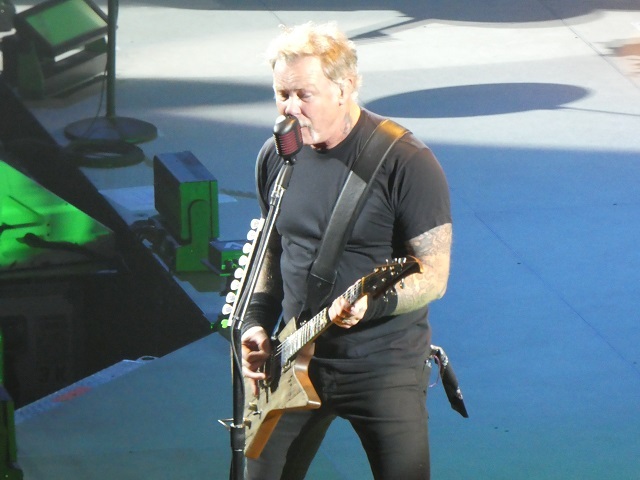 Metallica seems to enjoy every minute on stage and about midway through Hetfield stopped and expressed sincere appreciation for the fans who have stuck around and kept them around for so long. The “in the round” stage gives them an opportunity to address multiple facets of the audience during the course of the evening whether sticking to one side for the length of a song or moving about freely during another. Rarely, does any one section of the crowd not get at least a front row to someone from Metallica. 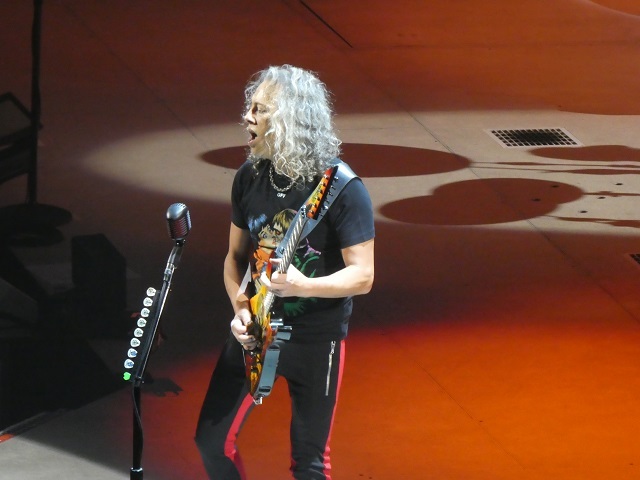 While Hetfield sings to one section, Hammett might play to the other side as Truillo stomps around on stage or plays his bass to a third area. Meanwhile Ulrich remains steadfastly in center, every so often his drum kit moves 45 degrees allowing him to eventually play to the entire crowd. And, don’t bother trying to catch the transition either. If you watch his backside at the start, then before you know it you capture the side view of his drumming then suddenly he stares right at you. Ulrich is just a blast to watch, too. Check him out during “Creeping Death.” All night, he hits the tom-toms, snare and those poor cymbals with such fierce determination, bordering on fury, as if to release some inner angst then he pops up from the kit, greets the audience with a smile between songs and then back center stage, sitting or standing, doesn’t matter he hits with precision every time. It was all worth the wait. Well, at least for me. Actually, it was worse from Spokane. But I always wear ear plugs. I figured as Kiss opens in Vancouver in which I will be there next September to see Maiden! I’d like to see Maiden and Judas priest. They are coming back in april. You see in kiss? In my area, a big fan could see them 4 times within A 5 hour drive. They’ll be raking in the dough for sure! This was my 12 yr old son’s first concert. Metallica put on an awesome show and will be something that we will both remember for the rest of our lives! That’s Great! I can’t wait to download the show and live it all again. Thanks for commenting. That Poison Idea song title is, Taken by surprise.